Looking towards the Valley of the Somme, in the far distance, from the lawn that marks the western edge of the Australian National Memorial and Military Cemetery, Villers-Bretonneaux. 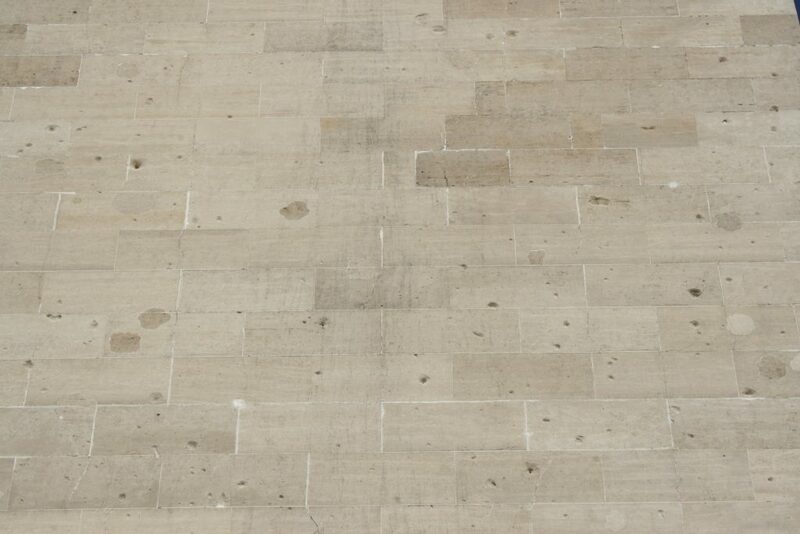 Backtrack. 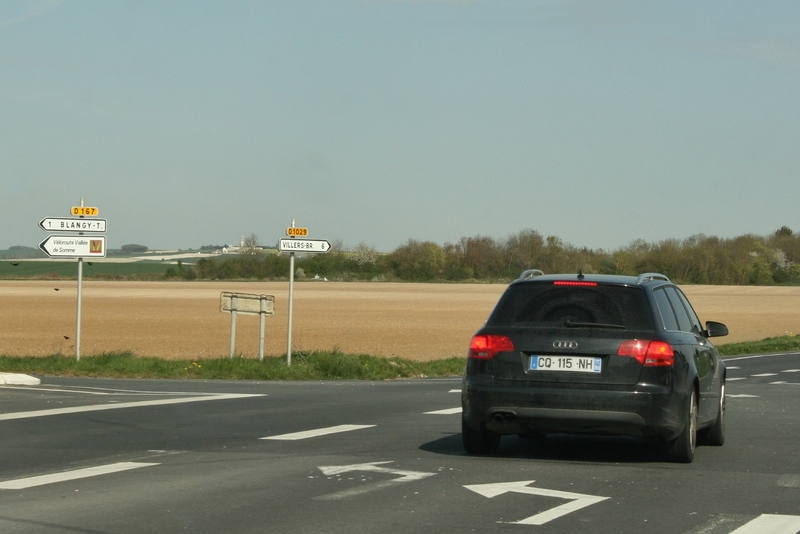 Snapshot from the car as we flash past. 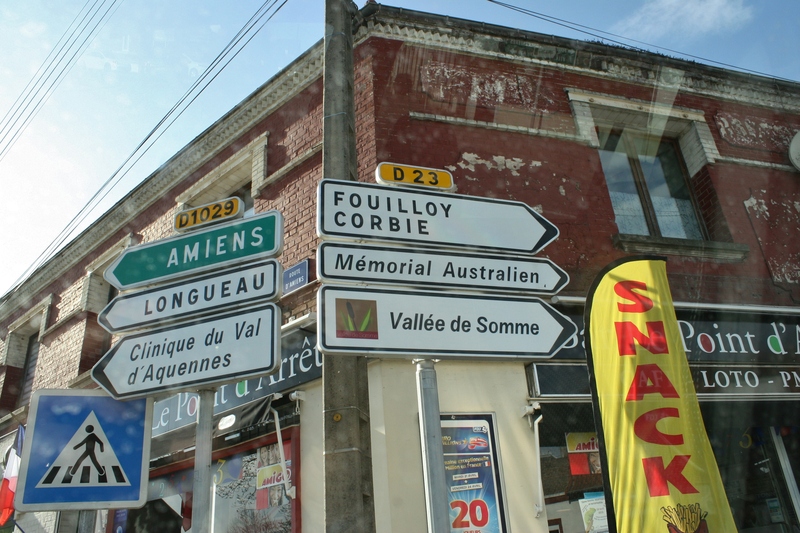 Signs with familiar names – we visited the rarely visited cemetery at Longueau, some of its headstones still bearing signs of fighting from a later war, a little while back. 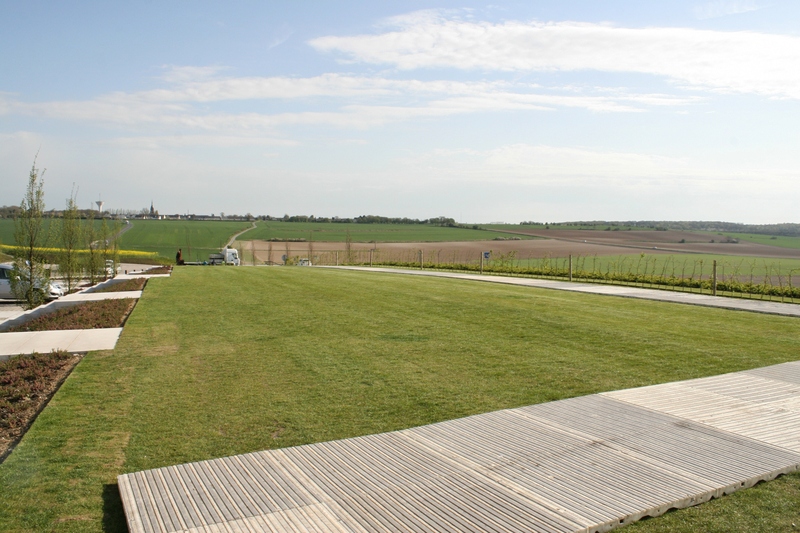 …there’s a car park. 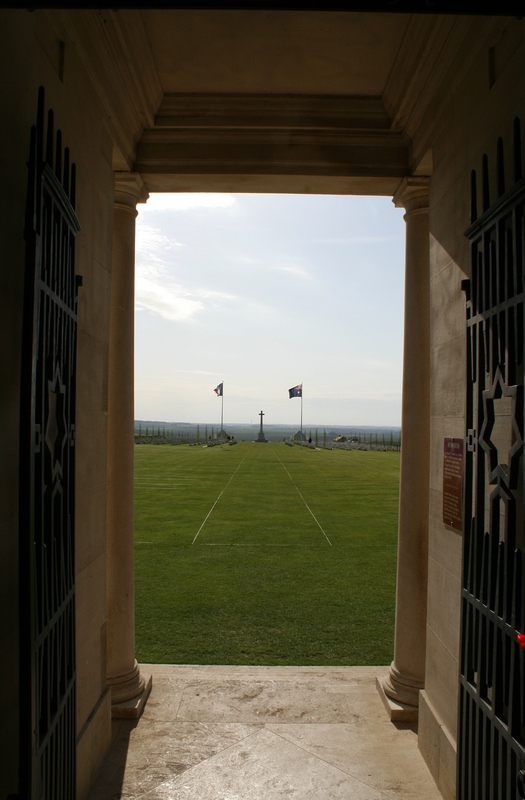 Villers-Bretonneaux on the horizon, by the way. 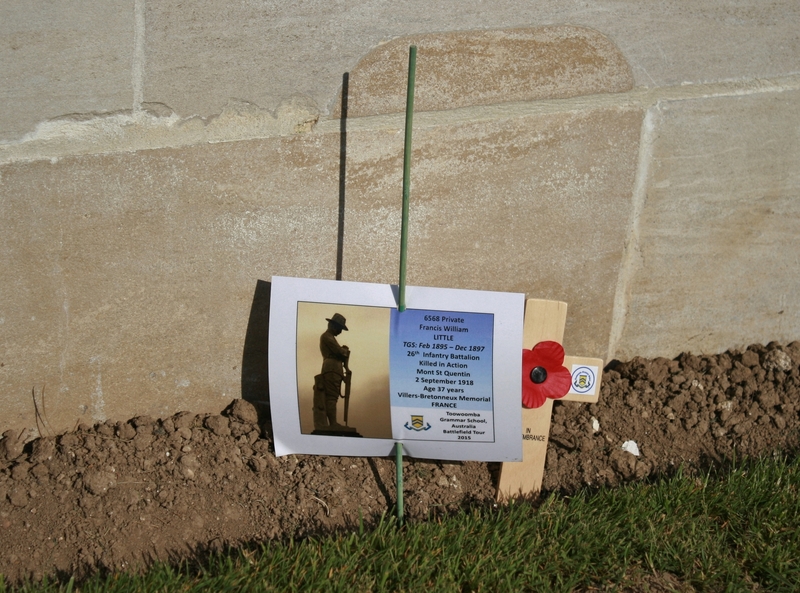 But we didn’t, of course. 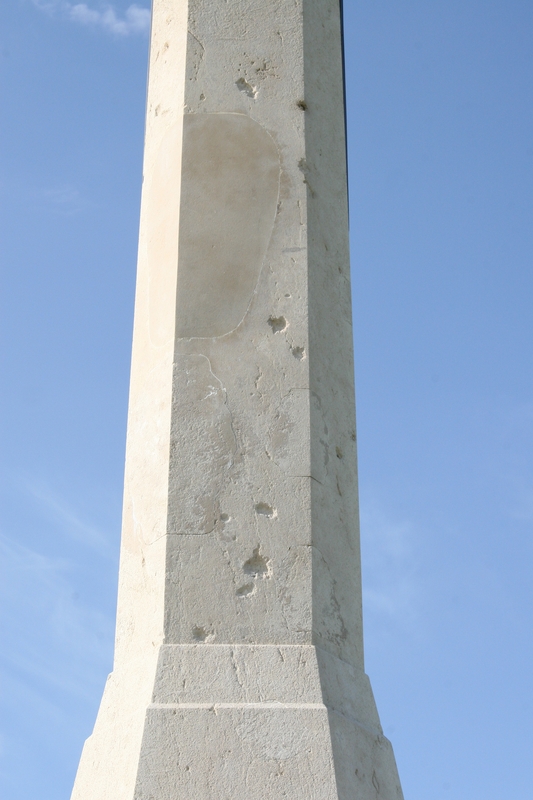 …that spatter the sides of the tower, a legacy of a skirmish that took place here in June 1940 between a German tank and a French machine gun positioned up in the tower. 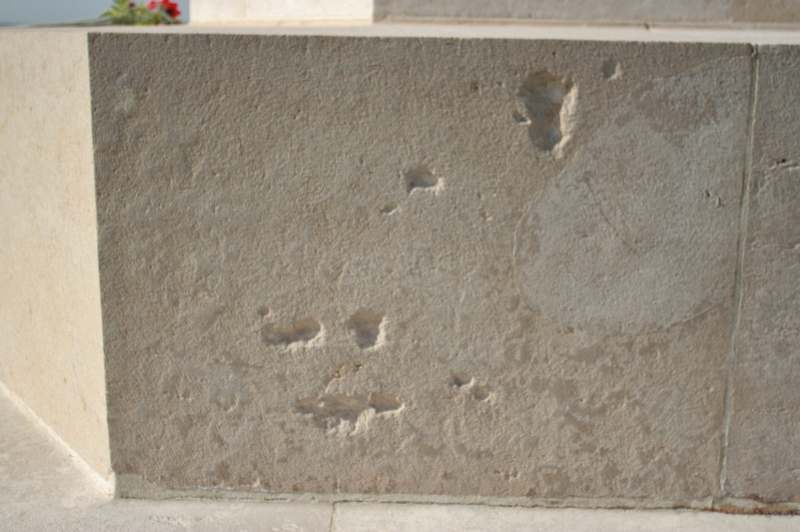 A Bf 109 joined in the fun too, and I suspect that these are the footprints of the plane’s cannon. 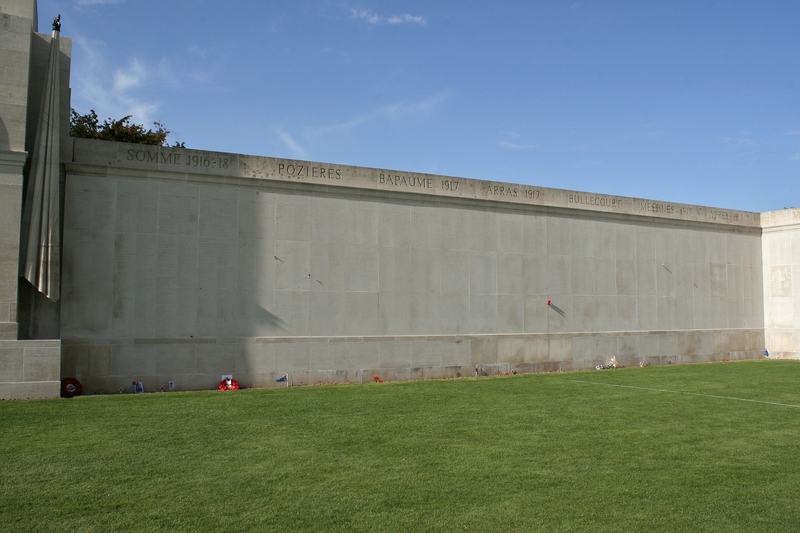 Anyway, before we take a closer look, here’s the memorial in all its glory. 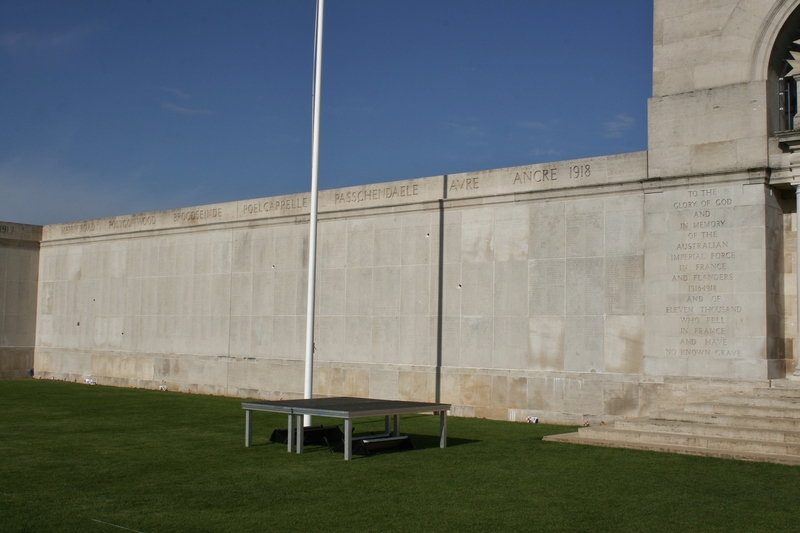 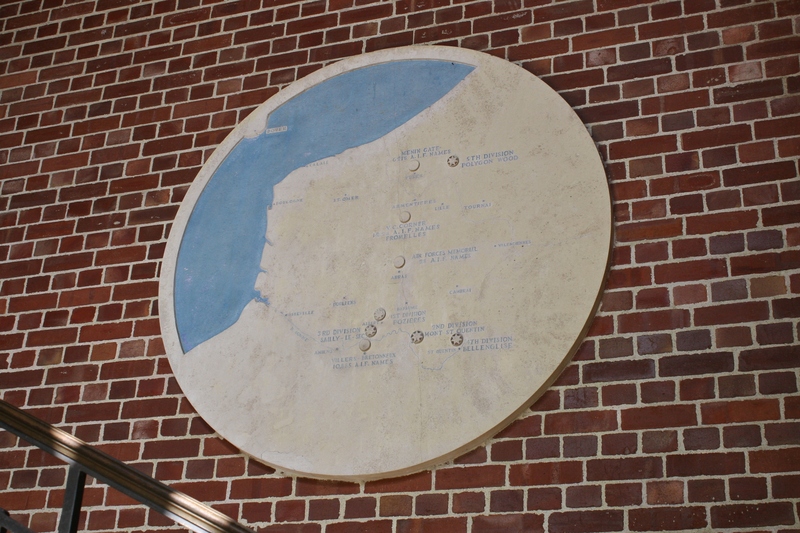 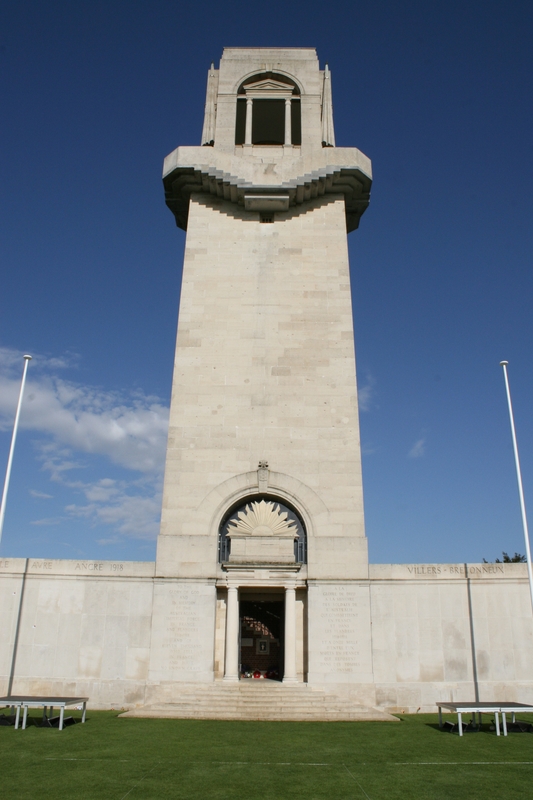 …you can climb the monument, this shot taken from behind the huge Australian rising sun above the memorial entrance. 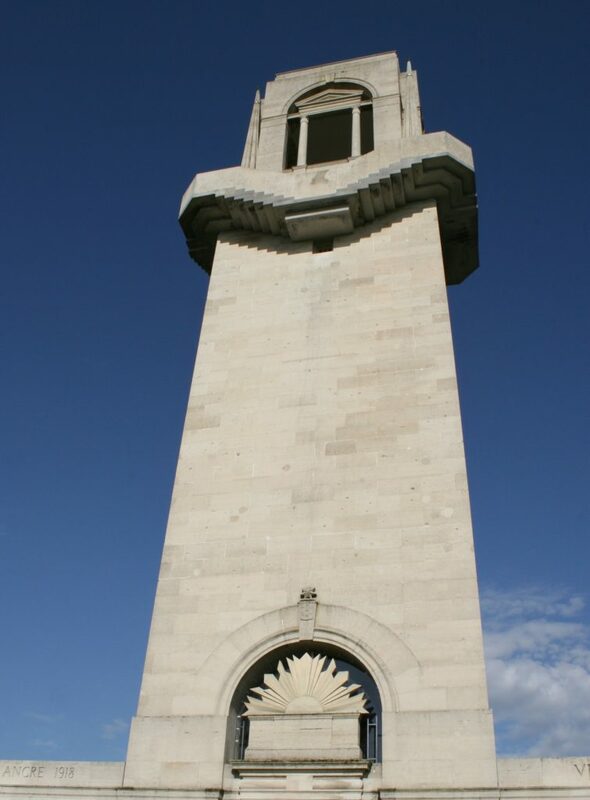 No time to go to the very top, I’m afraid (that’s my excuse, anyway). 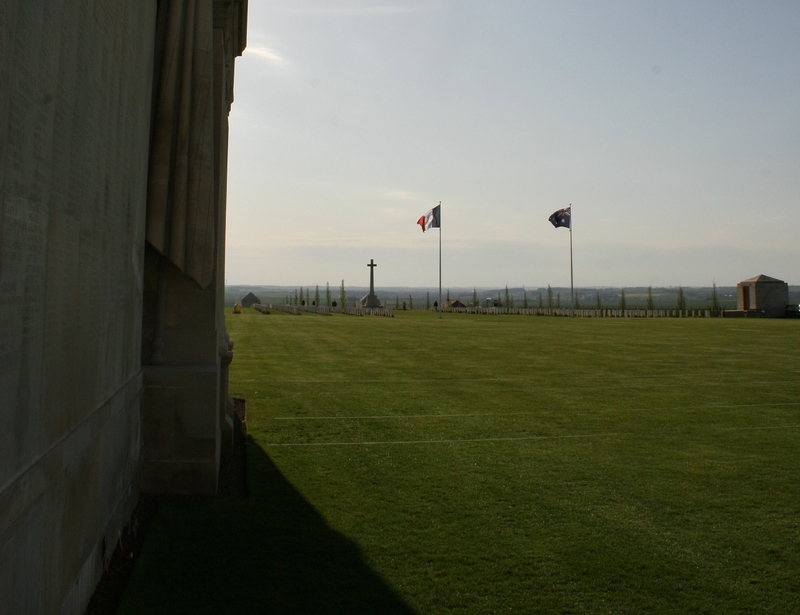 Outside, the grass has already been marked out for the forthcoming Anzac Day celebrations held here on 25th April each year. 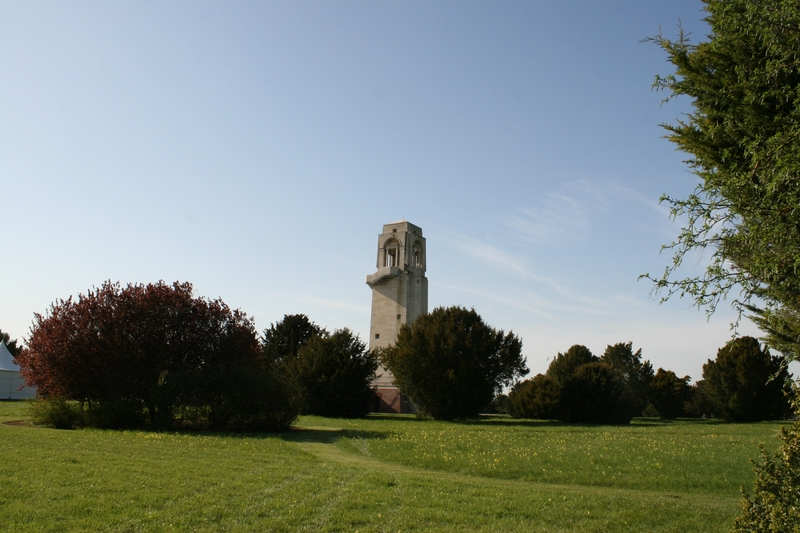 Don’t be fooled by the glorious weather folks – these photos were taken on a fine, but chilly, spring day. 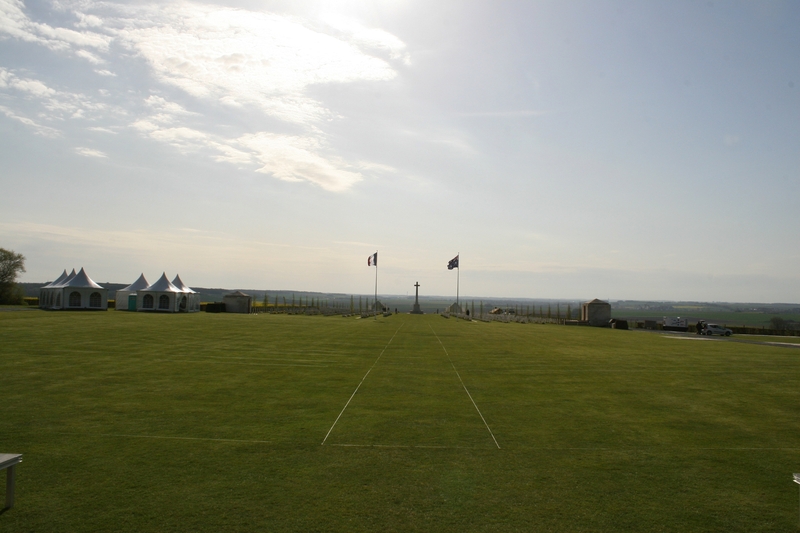 …the view west showing the strategic importance of this ridge to the north of Villers-Bretonneaux. 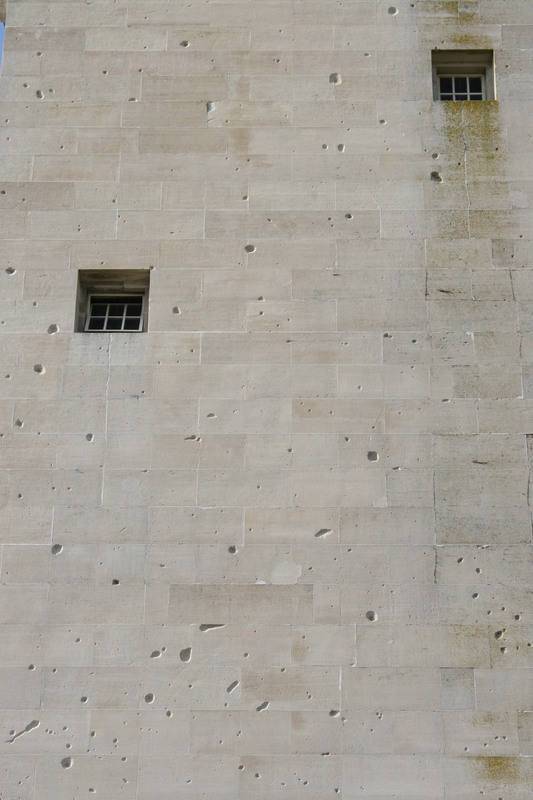 More bullet holes on the front of the tower (above & below), these I suspect from the tank’s machine gun. 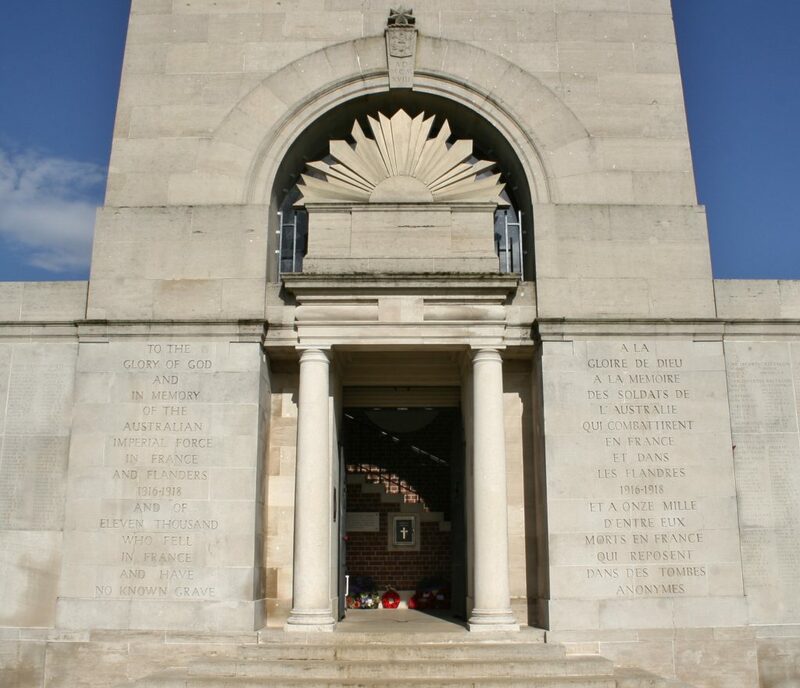 The columns of names continue to the left of the entrance. 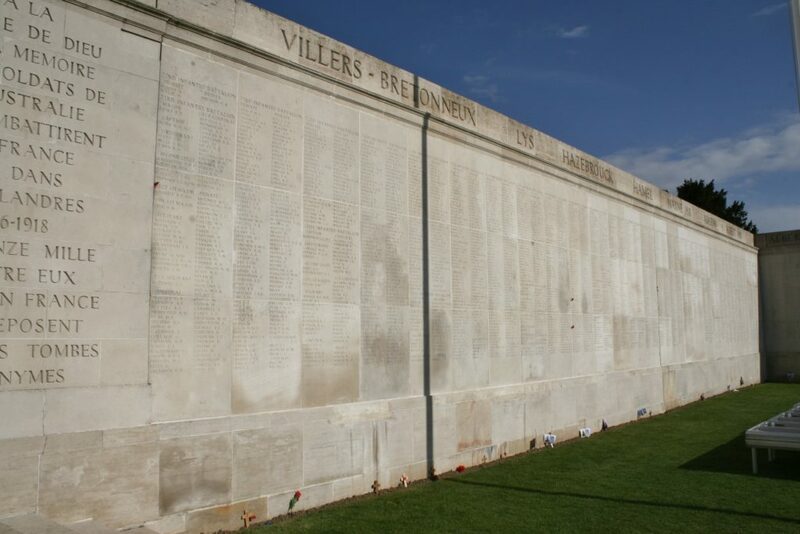 Next time I am here I shall allow time to photograph each panel, be warned! I’m not sure if that is aimed at Baldrick, or you lot. Probably both. 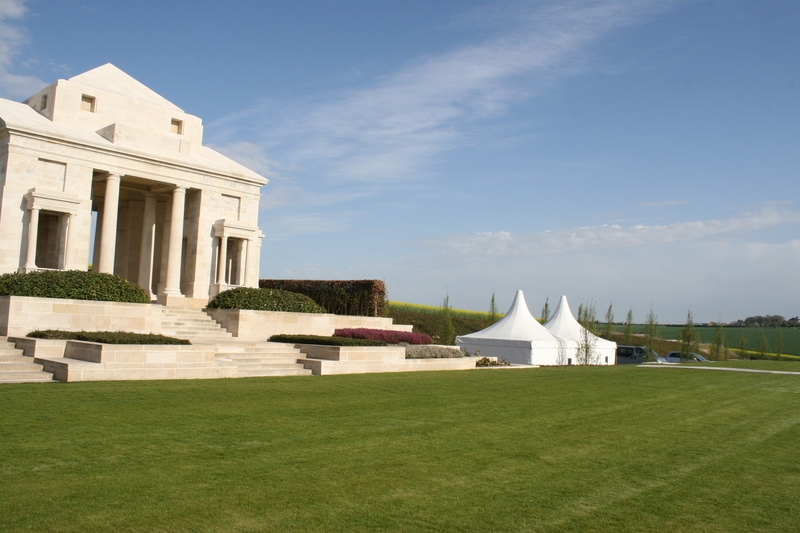 Time now to wander down to the cemetery; the tents have been erected, again, for the forthcoming commemorations. 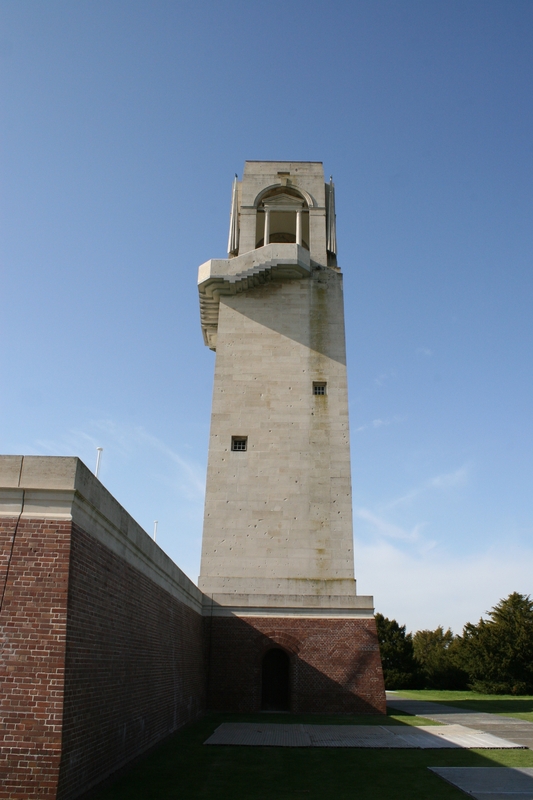 One of a handful of photos I have included courtesy of Baldrick (thank you, good Sir), this one of your photographer shooting (forgive me) the bullet holes on the tower a little earlier. 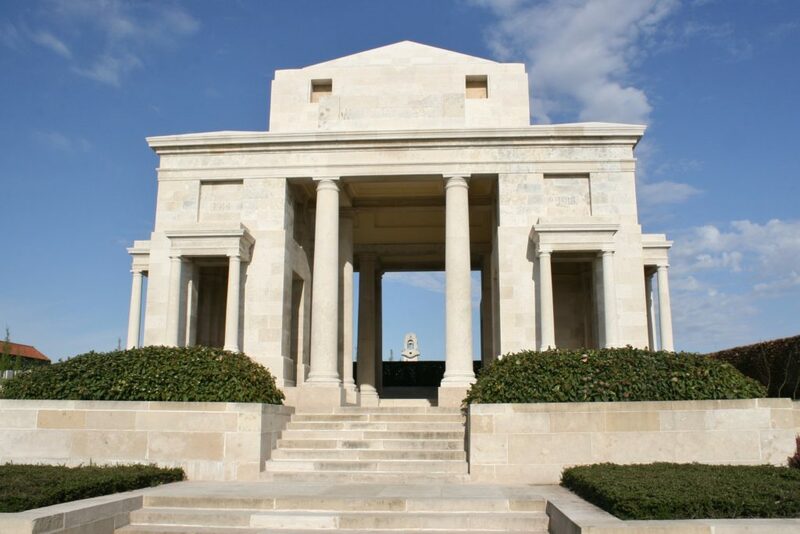 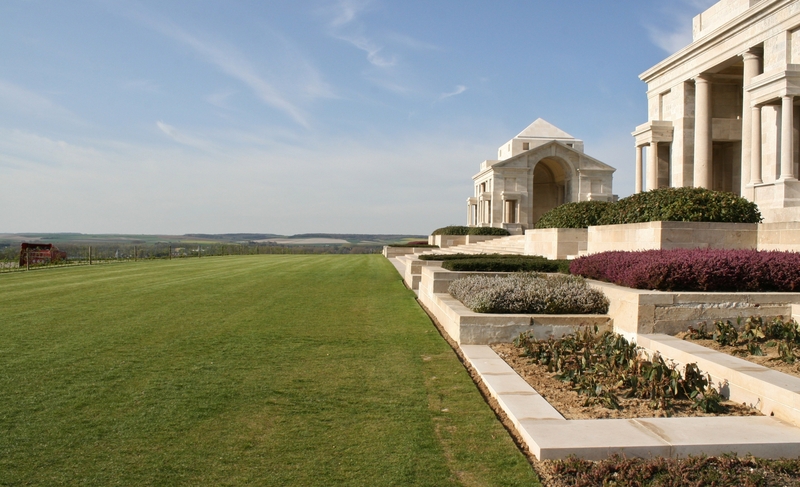 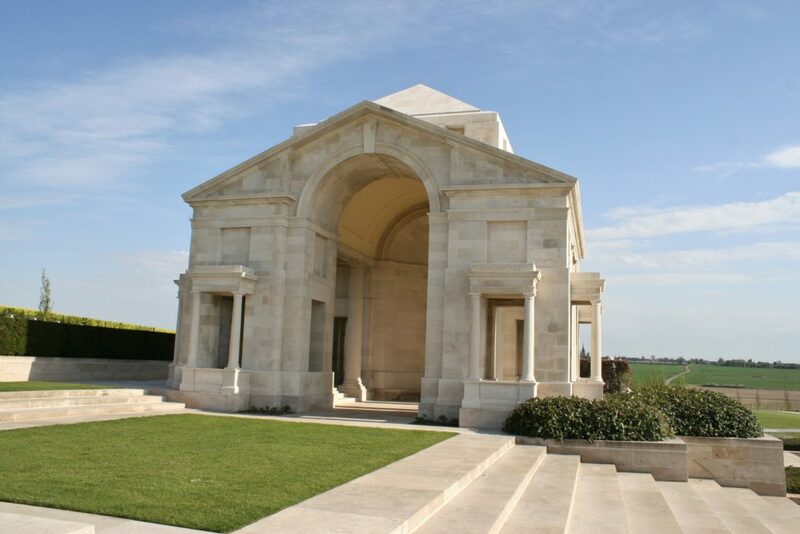 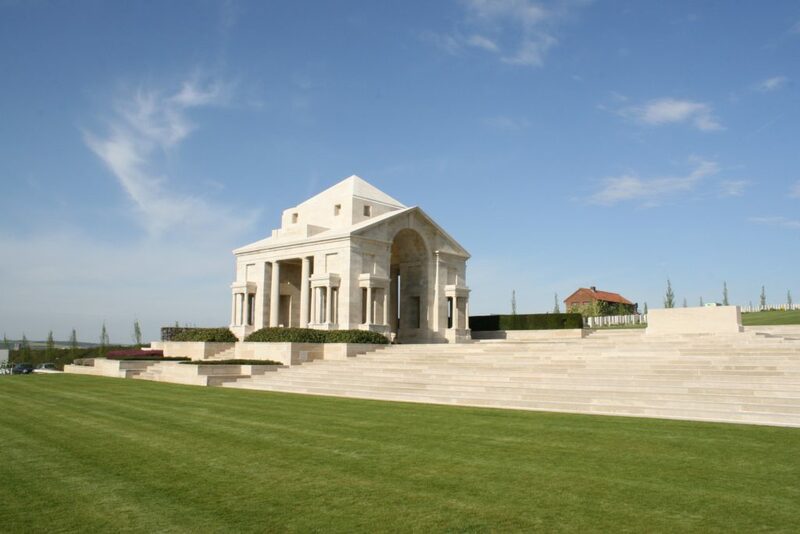 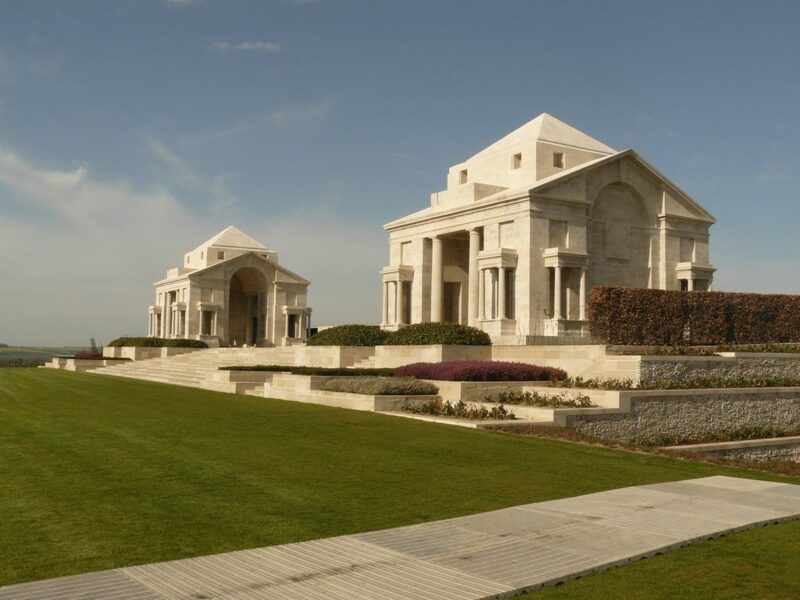 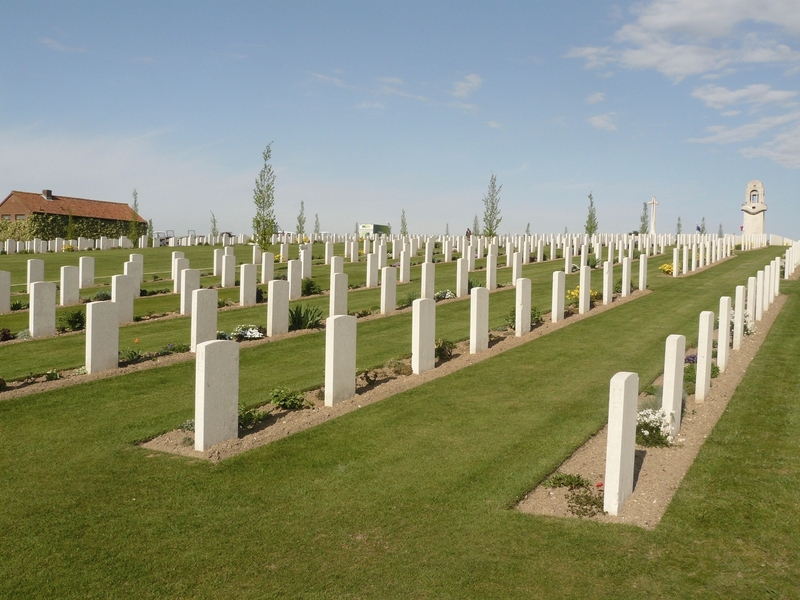 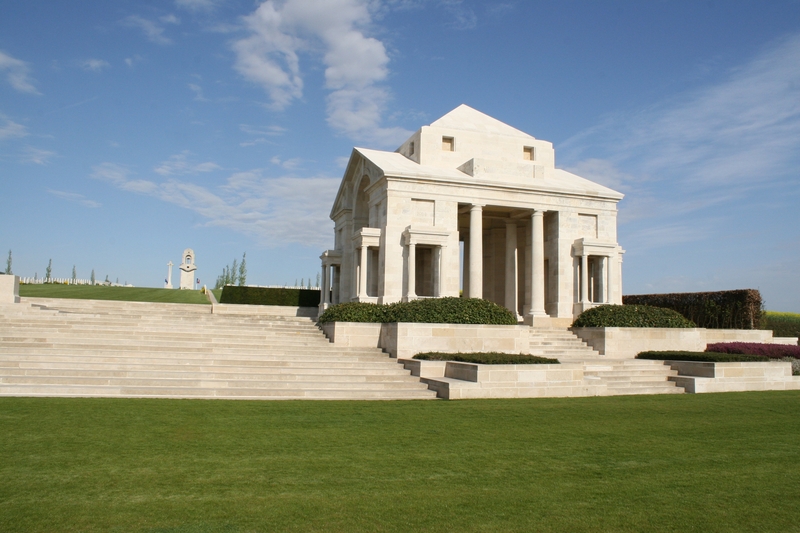 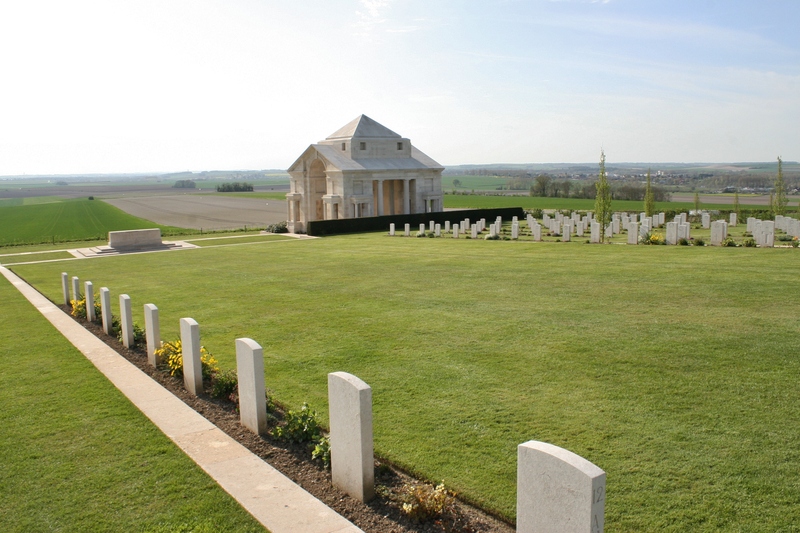 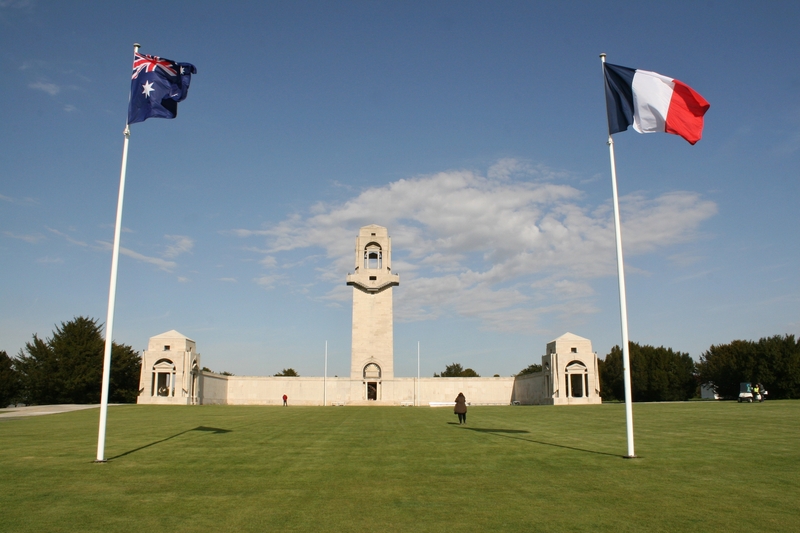 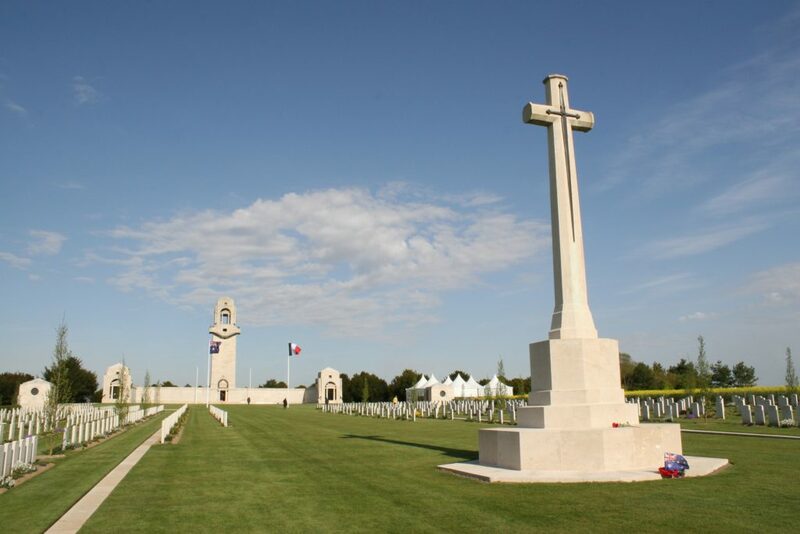 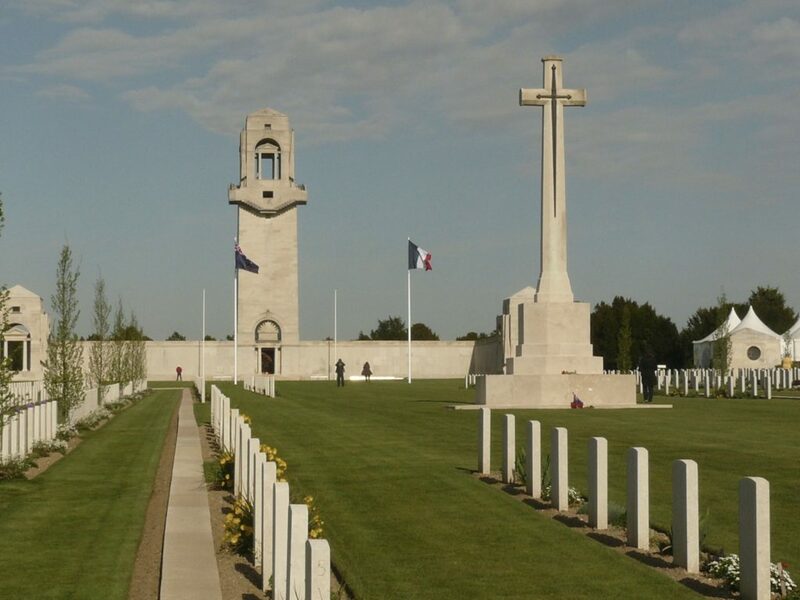 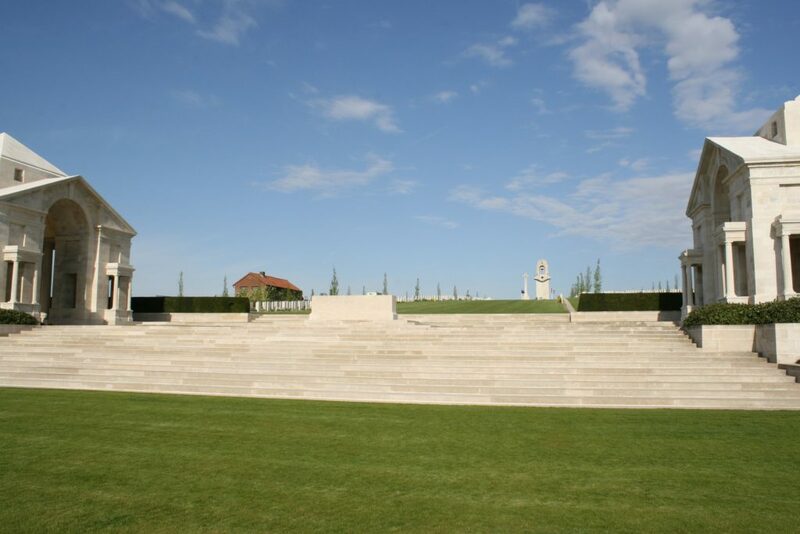 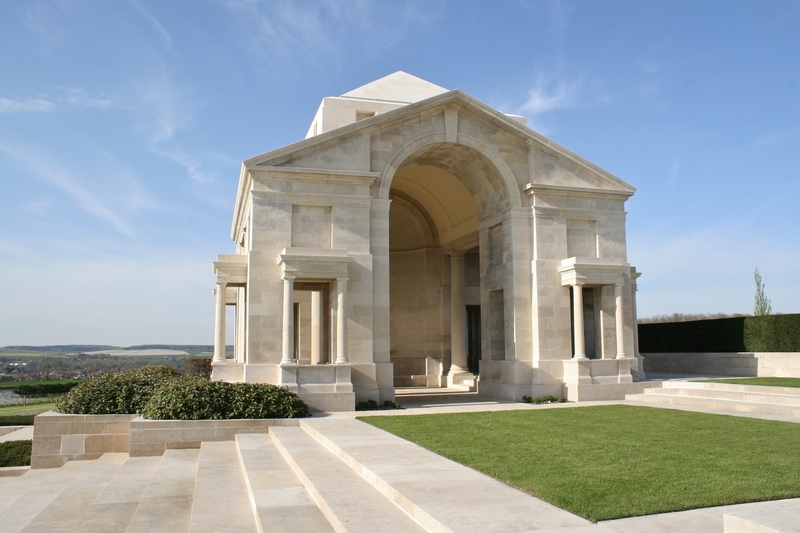 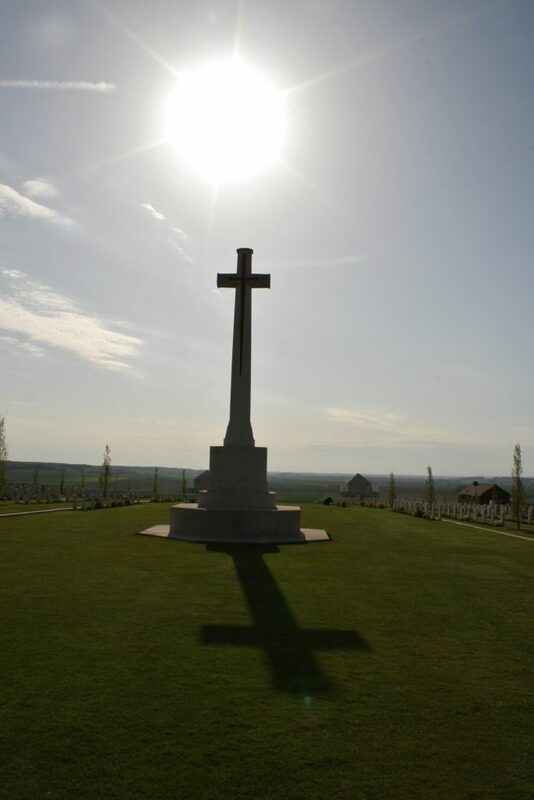 Villers-Bretonneux Military Cemetery is a post-war cemetery, made when graves were brought here to Hill 104 from smaller graveyards in the area and from the nearby battlefields. …these bullet holes most likely also inflicted by the machine gun on the German tank, as we know that it entered the cemetery near one of the portals at the cemetery’s western edge. …and photograph. 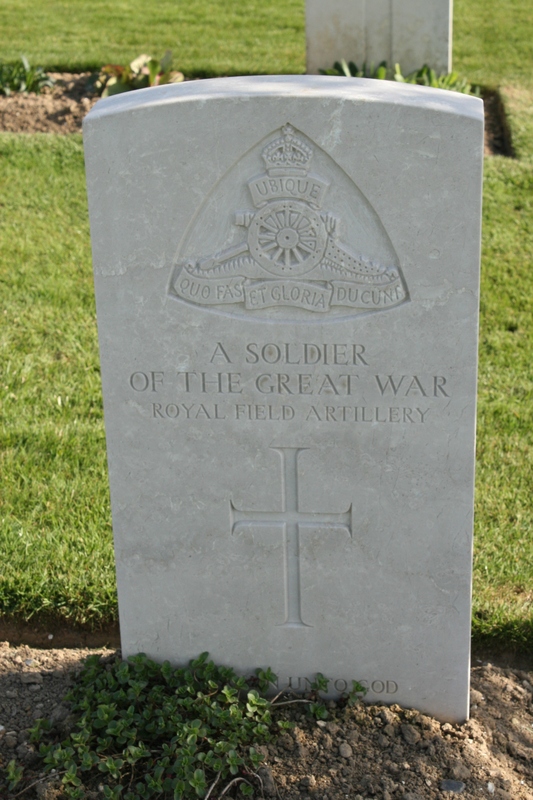 Ironically, a rubbish one! 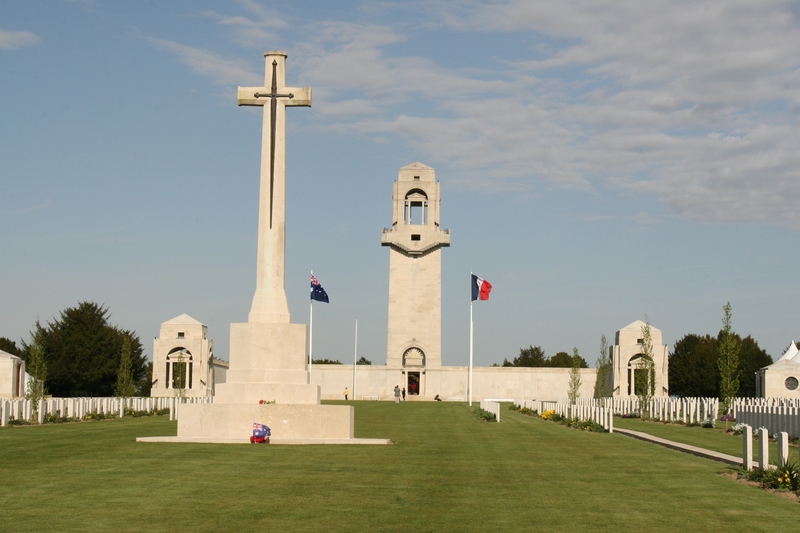 Within a year of the war’s end the majority of the burials, split into twenty plots, had been made, mostly Australians killed between March & August 1918. 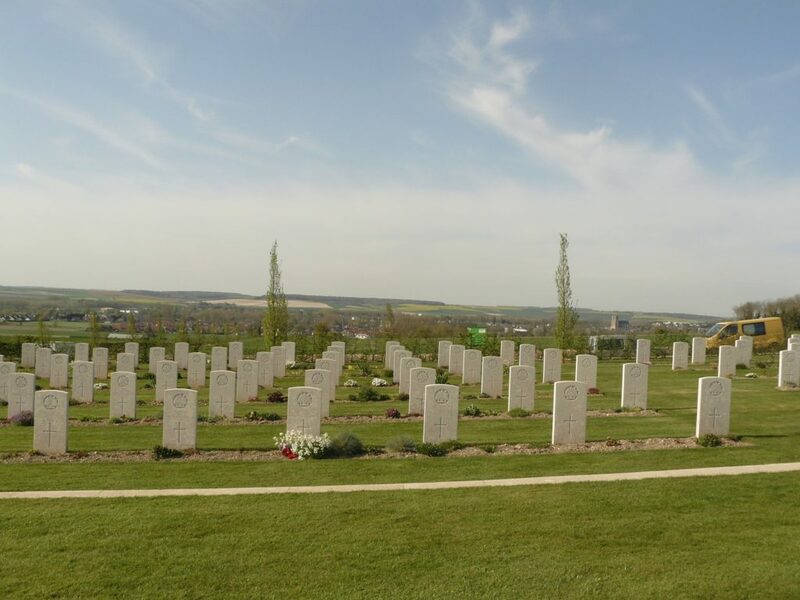 Extra rows were added to some of the plots (right, nearest camera) as more bodies from wider afield were brought here in the early 1920s, although a large number of these reinterments could not be identified, and the final burials were made here when 444 graves were brought in from Dury Hospital Military Cemetery, on the road south out of Amiens, where British medical units had used the asylum buildings as a hospital between August 1918 and January 1919. 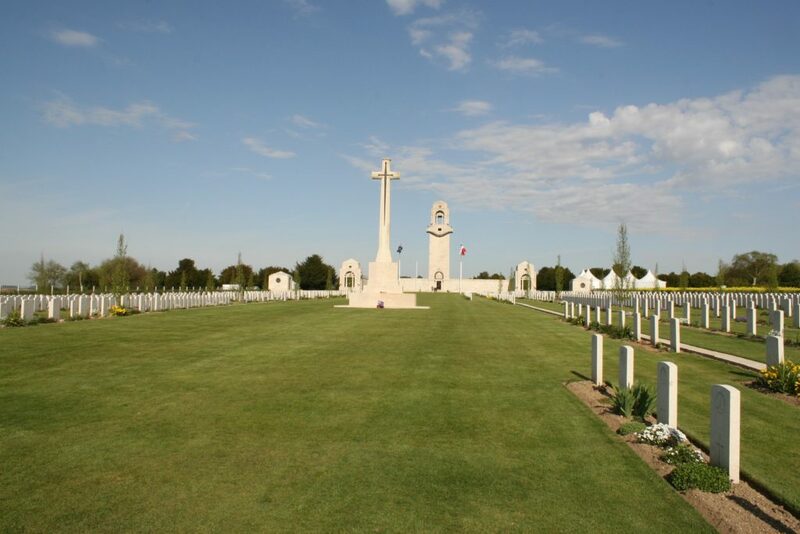 All of which you can see on the cemetery plan, courtesy of the CWGC. 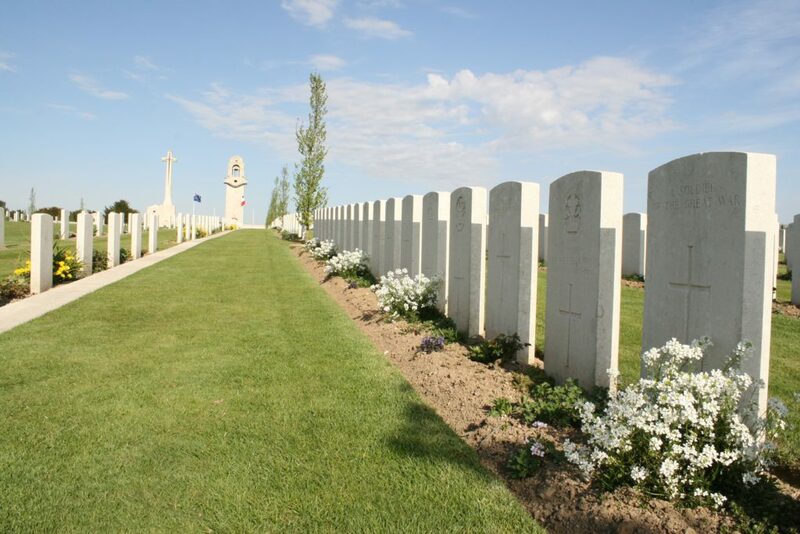 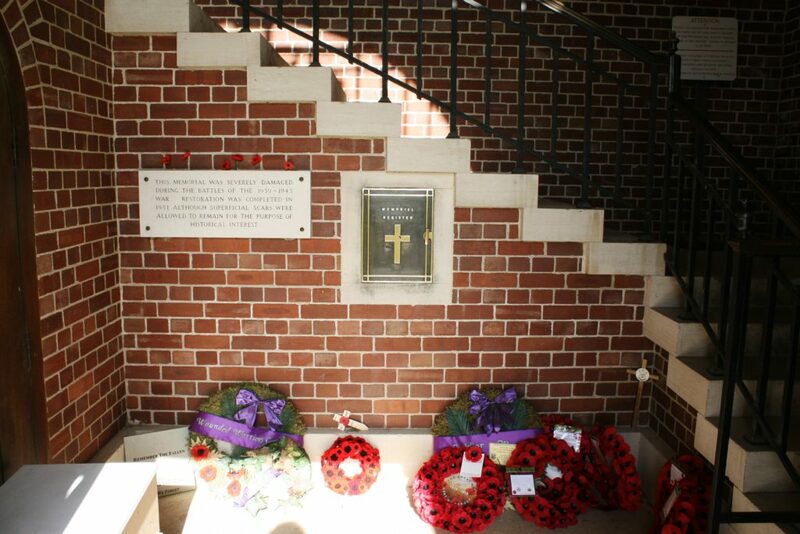 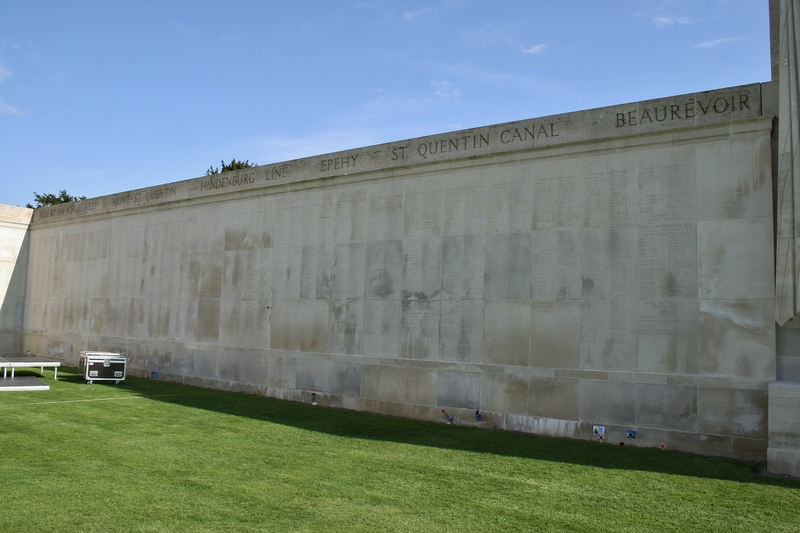 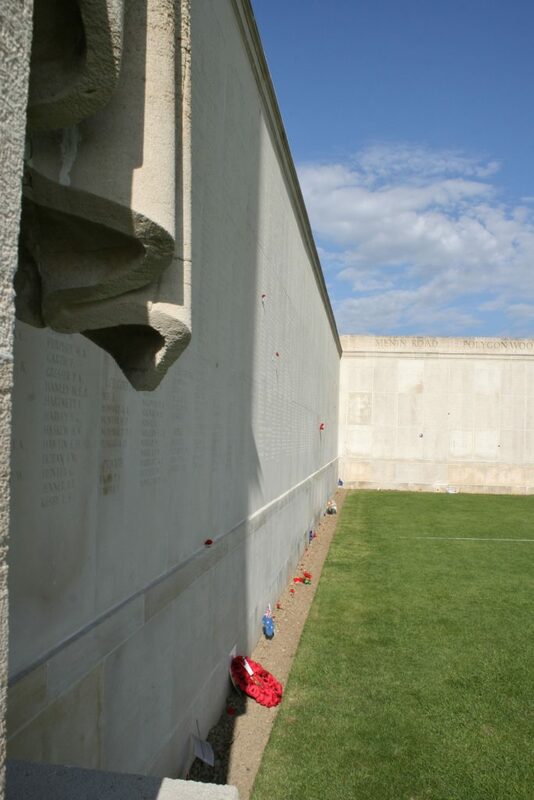 More than 2,100 men are now buried or commemorated in the cemetery, three quarters of whom are identified. 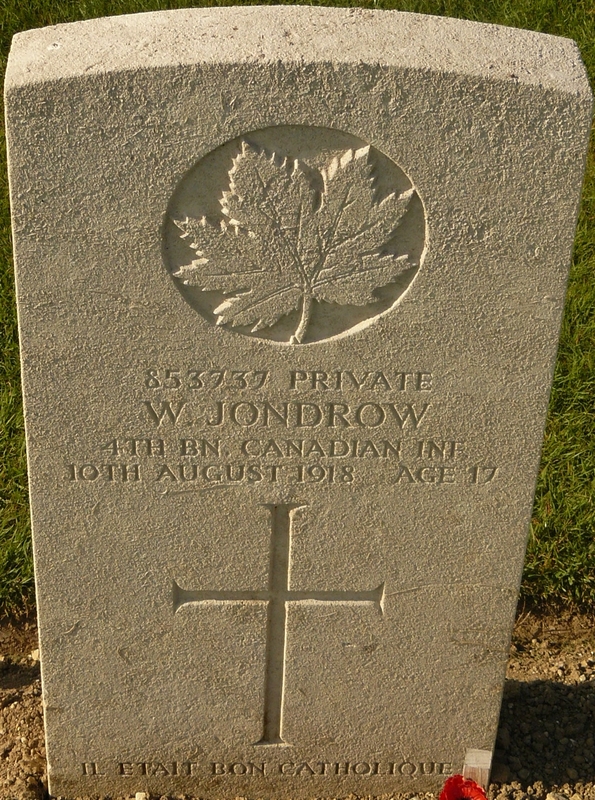 Among the 250 or so identified Canadians buried here, Baldrick spotted, and photographed, the headstone of a young French-Canadian, Private W. Jondrow, only seventeen, killed in the first few days of the final Allied offensive of the war. 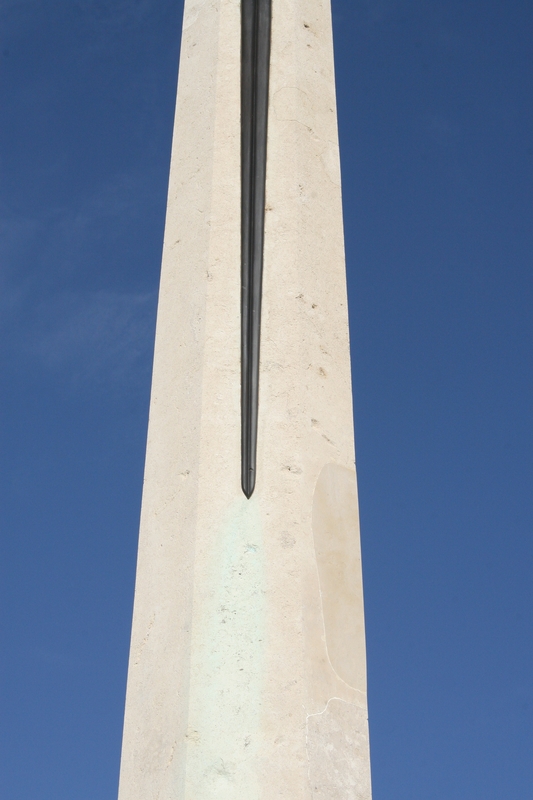 ‘Il etait bon Catholique’. All but eighty eight of the identified men in the cemetery were killed in 1918. Among these eighty eight, two are Second World War casualties, New Zealand airmen killed in April 1945, two men died in 1915 and two in 1917, and eleven died in 1919. 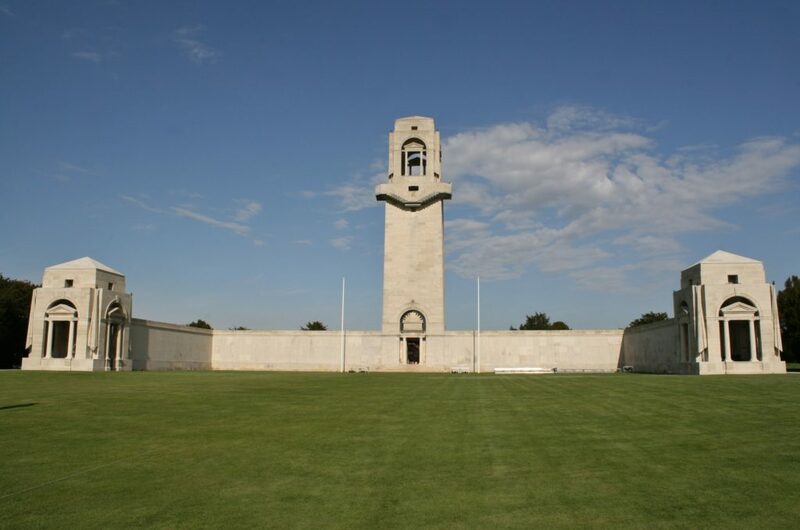 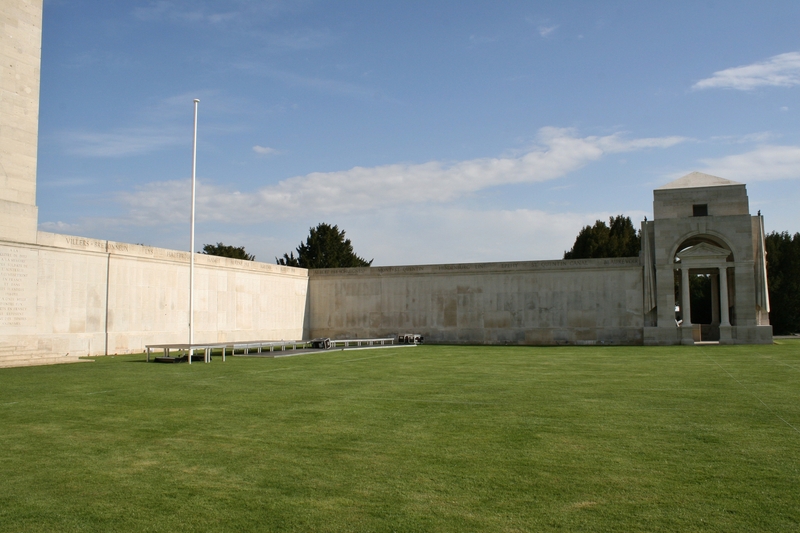 Which leaves sixty one men buried here who died in 1916. 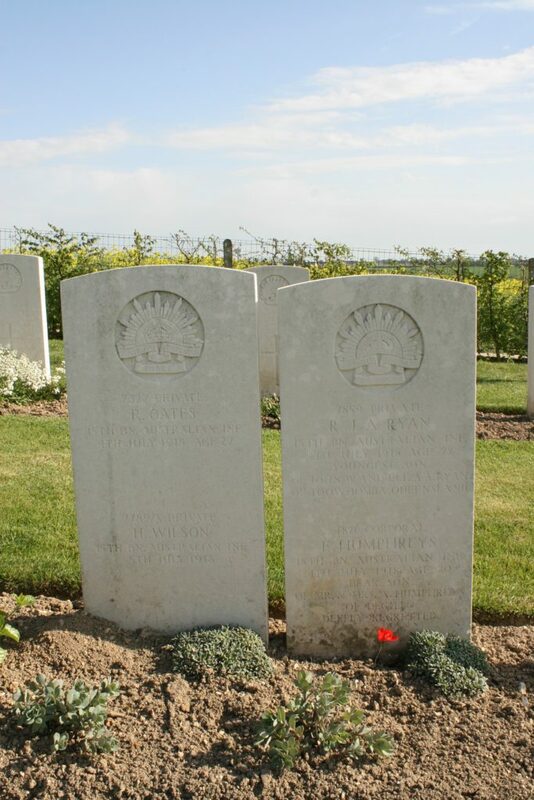 Two headstones, four names, Australians killed in early July 1918. 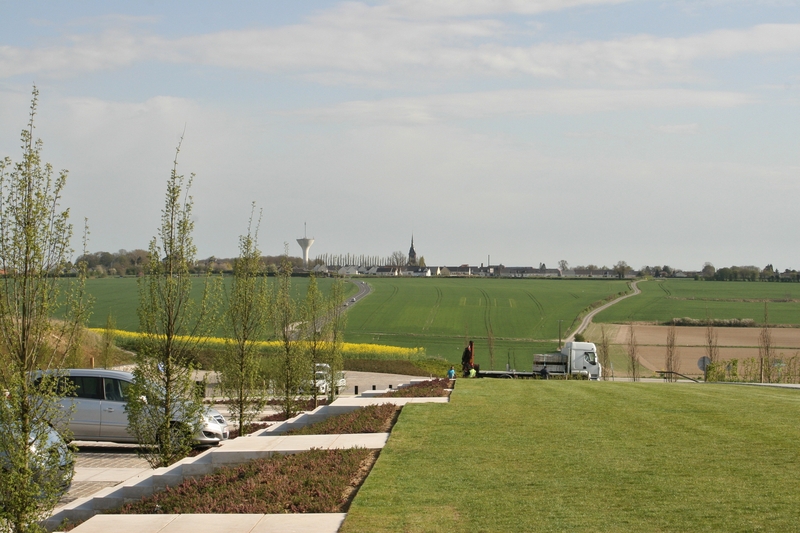 …and turning round, the western view towards Amiens. The two portals (above & following) to the left and right of the cemetery steps. 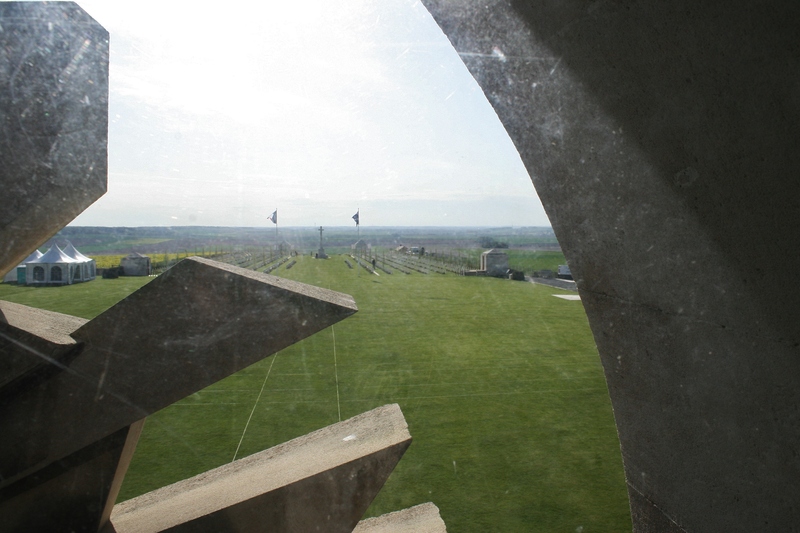 …but, luckily, our visit took place before work had begun. Hardly surprising as he designed not only the cemetery, but the memorial as well. 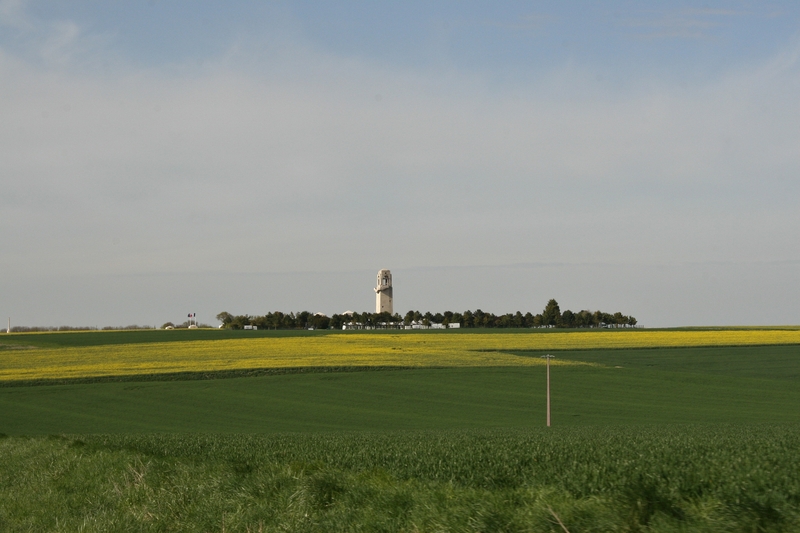 Looking south across the valley between Hill 104 and Villers-Bretoneaux, on the left horizon; Australian & British troops swept across these fields from right to left as they counterattacked to encircle the town late on the evening of 24th April 1918, irrevocably halting the German advance west (see previous post for details). 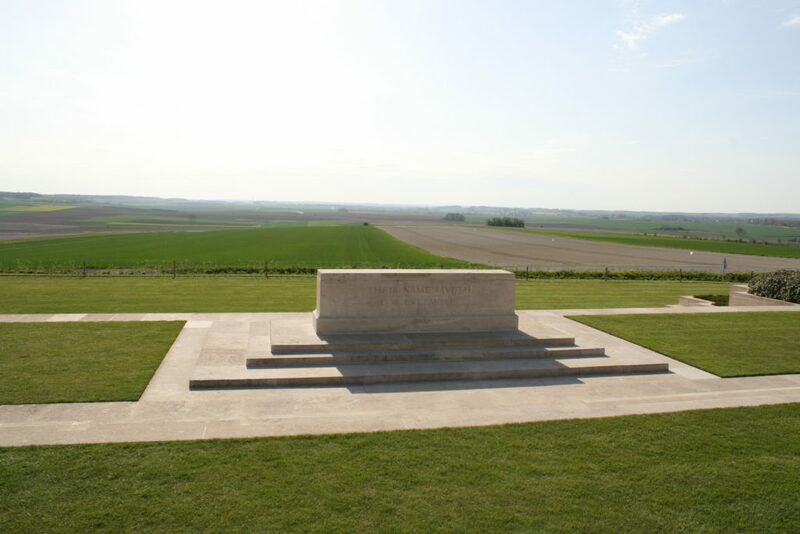 The promised land to the west, the land that the Germans looked out on for twenty four hours in April 1918 but were unable to capture, and by failing to do so, lost any chance they may have had of winning the war. 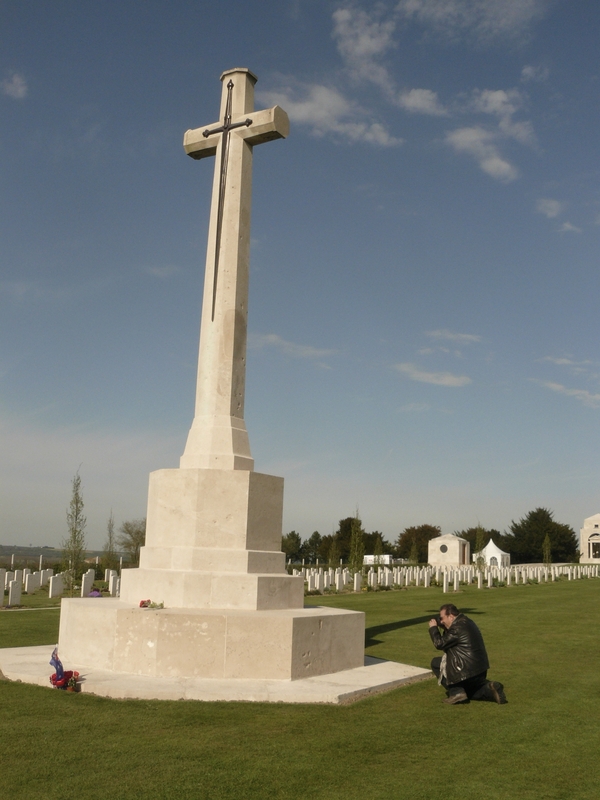 Baldrick’s favourite photo – taken by Baldrick. 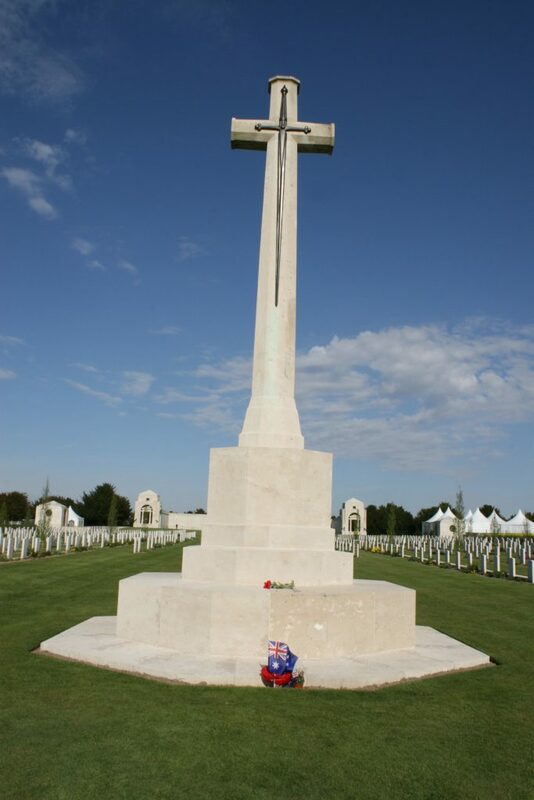 This military cemetery, however, is not the only burial ground around Villers-Bretonneaux, so next post will find us back in the town to pay a visit to Adelaide Cemetery, as I promised last time. 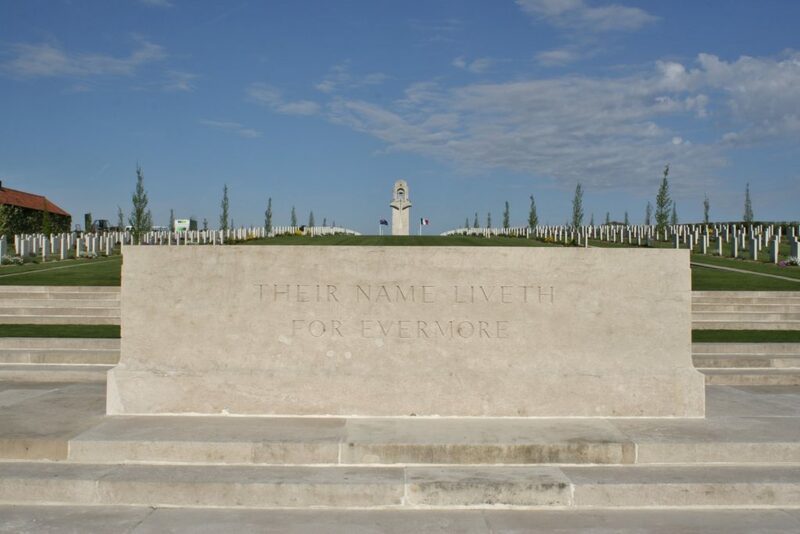 This entry was posted in The Somme, Villers-Bretonneux. Bookmark the permalink. 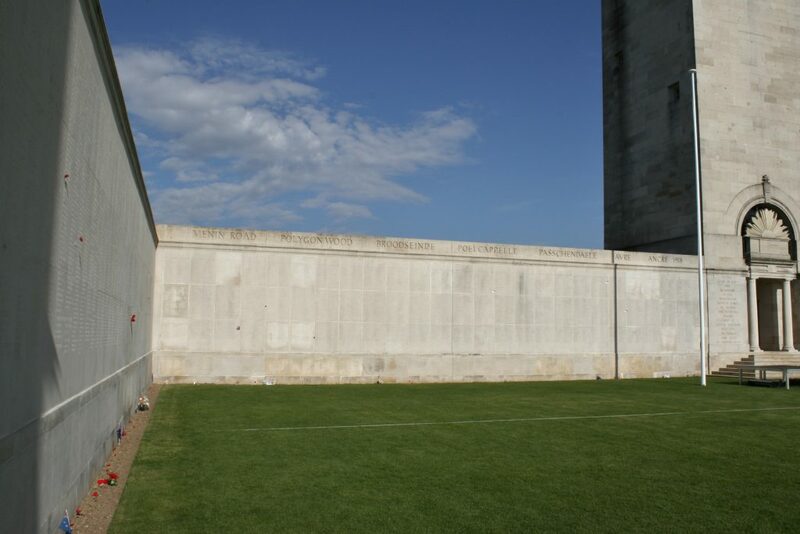 Cheers Sid! 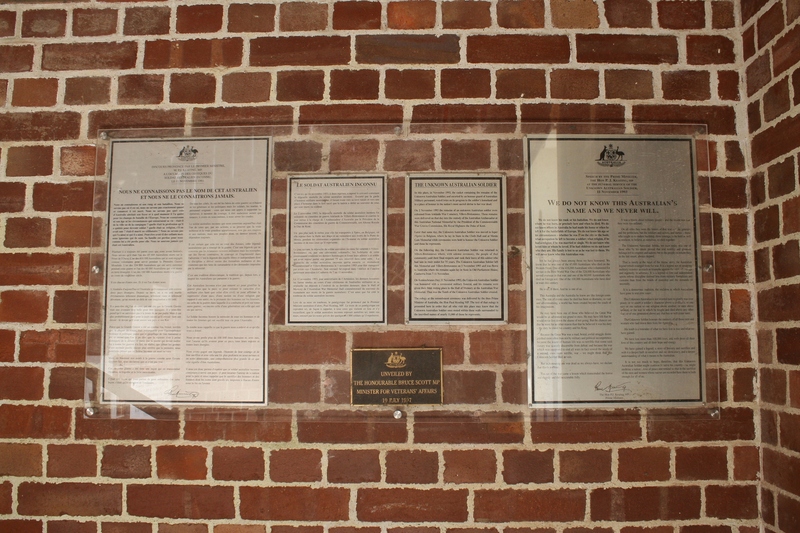 Correction made (silly me). 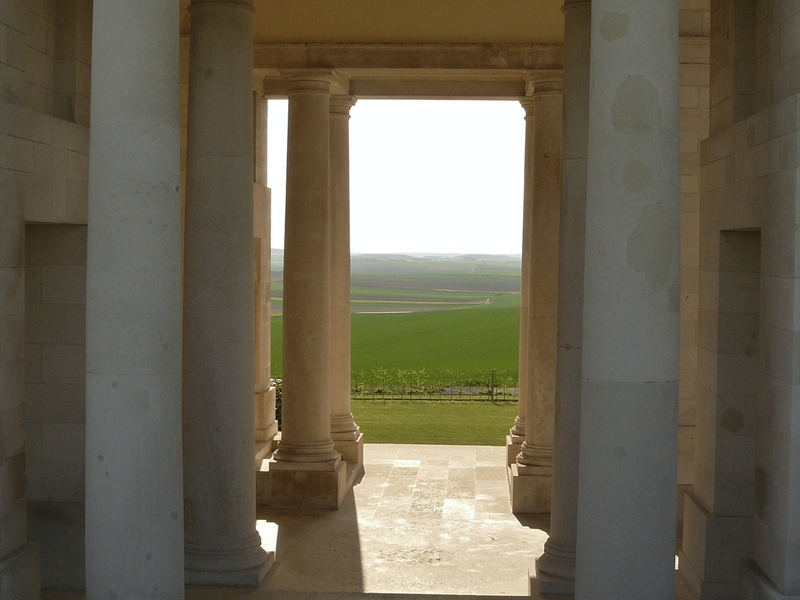 Very pleased you liked ths one – I’ve been looking forward to ‘presenting’ these Villers-Bretonneaux posts to you for a while now.